My art work is a reflection of places Iâ��ve been over the years. I am a hiker and I enjoy being outdoors, so I try to paint plein air whenever possible, or I will sketch a scene. I didnâ��t start painting until I was in my early forties. Before then the idea of becoming an artist had really never crossed my mind. However, I was enrolled, by my employer, in a weekend oil painting course put on by her at the craft store where I was working part time. I wasnâ��t too happy about it and attended under duress feeling it would be a complete waste of time, but by the end of the workshop I was hooked. Over the years I have persued my art education, including credit courses at the Alberta College of Art in Calgary. I also try to take a workshop each year with an artist I admire in order to learn new skills, or to further develop those I already have. To me art is capturing a moment, and painting it on a canvas, so I can save it for others who have not been as fortunate as I to witness the beauty at that time. I make every effort to portray the scenes I paint as realistically as possible, so I take the extra time to really look at the country I am privileged to pass through. I strive to give the gifts of that scene I see to others, in the form of a work of art. My husband and I have lived in Revelstoke for 9 years now. 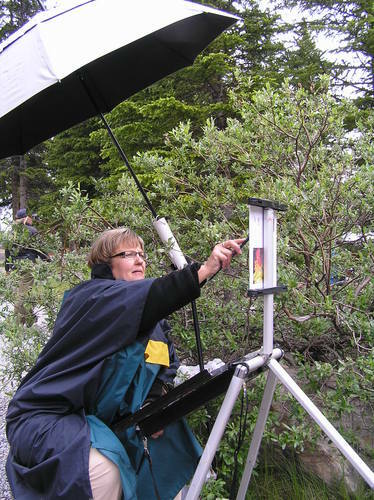 I am a member of the Revelstoke Visual Art Centre, where I teach beginnerâ��s oil painting. My medium of choice is oils as I appreciate their beautiful richness and texture, but I do use acrylics on occasion. I have exhibited in the Windermere Valley, Canmore, Cochrane, and Revelstoke. My collectors are from the Bahamas, England, Germany, New Zealand, Switzerland, the United States, and Canada. Some career accomplishments include: teaching painting classes and seeing some of those students become competent artists, having one of my paintings used as a book jacket (Mountain Odyssey, by Brent Lea, published by Heritage Books), and being chosen to do a mural for BC Hydro at the Revelstoke Dam.